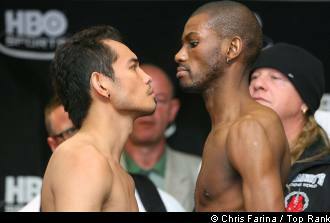 Jeffrey Mathebula will face WBO superbantamweight king Nonito “The Filipino Flash” Donaire in Carson, California. Mathebula, 33, was born in Malamulele, South Africa and currently the IBF junior featherweight champion. The authoritative Ring Magazine listed him as the sixth best super bantamweight boxer while Donaire is ranked fourth best pound-for-pound fighter in the whole world. Mathebula represented his country at the 2000 Summer Olympics in Sydney in the featherweight division, where he won over Noureddine Madjhoud of Algeria, 10-5 in the first round but lost to Bekzat Sattarkhanov of Kazakhstan, 5-16 in the second round. He finished his amateur career with an impressive record of 101–4. Mathebula fought his professional debut on February 17, 2001 winning against Tally Disoloane. He fought to a draw two fellow South African boxers Bonani Hlwatika in August 27, 2002 and Malcolm Klassen in September 28, 2004, both six round bouts and both fought in Temba, North West, South Africa. Mathebula defeated Hlwatika in a rematch by a unanimous decision in 12 rounds in February 15, 2003. Mathebula outclassed Julio Zarate by a unanimous decision with the scores of 117–109 twice and 118–109 in an IBF super bantamweight title eliminator in Temba on August 29, 2008, after sending him to the canvas twice in round ten. He was slated to face then IBF super bantamweight champion Steve Molitor, but Molitor lost to Celestino Caballero of Panama. Mathebula instead faced Caballero for the WBA world and IBF world super bantamweight title. However, the South African lost his first world title shot against Caballero via a split decision at the Roberto Duran Arena in Panama on April 30, 2009. Two judges scored 112-116 for the Panamian and one judge favored Mathebula, 116-112. It was the South African’s first fight outside his country. After losing to Takalani Ndlovu on a split decision in an IBF junior featherweight title eliminator in Brakpan, Gauteng, South Africa in September 1, 2010, Mathebula defeated Ndlovu via a split decision when they faced on a rematch in Brakpan to win the IBF junior featherweight championship in March 24, 2012. "This is a very tough fight," said Top Rank promoter Bob Arum referring to the Donaire bout. "Mathebula is a very good boxer, he's very, very tall, and he's got a lot of experience and a tremendous amateur background." His face off with Donaire will be Mathebula’s only second fight away from home. He hasn’t fought so much quality opponents. This makes Mathebula the underdog going tomorrow’s unification fight.